OK, I snapped this photo a few days ago because it represented an entire meme of stupidity. 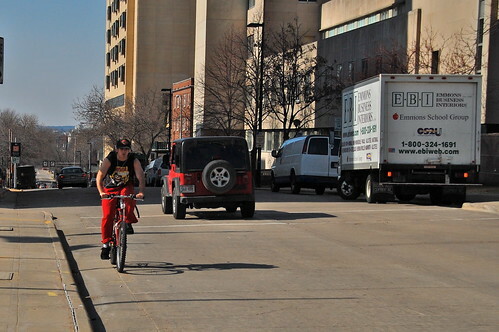 As you can see, this dough-headed bicyclist is riding the wrong way up a one way street. At this moment there is not a lot of traffic but this is a reasonably busy street, and the building on the right is the cop shop. So I have a specific question, and a related one. What the hell is wrong with the dumb shits that insist on walking down the middle of the street, eschewing the perfectly serviceable sidewalk located about 12 feet away to either side? Their sullen shamble is almost a plea to "Hit Me!" ins some misbegotten plan to collect insurance money. Perhaps my through-street East Side location attracts more than its share of these street idiots, but I see it elsewhere as well. OK, that's my curmudgeon rant for the month. Back to fun topics! I've noticed the "walk down the middle of the street instead of the convenient sidewalks" thing too, on the street I live on that intersects the street you live on. I have no idea what that's all about. At least those damn kids are staying off my lanw that way, I guess?